So I came into Shadow of the Comet cold, which might actually not be a bad way to do it. The game certainly welcomes newcomers, and has no issue with taking time to teach some Cthulhu lore that Lovecraft fans might already have memorized. That doesn’t mean the other side can’t have fun, though. At its heart, this is an original mystery game. It just so happens that at the end of your three day journey, you might gaze into the face of an Ancient God and go hopelessly mad. 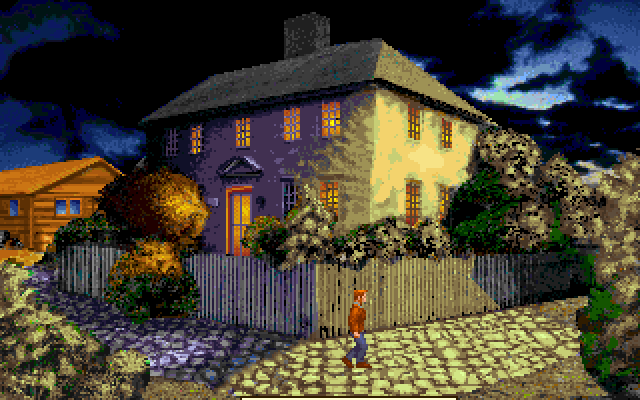 We begin our tale in 1834, where respected British scientist Lord Boleskine has traveled to the small New England village of Illsmouth. He’s on the trail of Halley’s Comet, and has reason to believe the comet will pass close enough to Illsmouth to see with the naked eye. He returns to London (or more properly, is returned) in a state of violent hysteria with only a few drawings to possibly back up his claim. Now, 75 years later, the comet is returning and astronomer John Parker convinces a London magazine to fund his trip to Illsmouth. Using clues he’s pieced together from Boleskine’s writings, he hopes to use photography to irrefutably prove Boleskine’s theory correct. You control Parker during his hunt, and arrive in Illsmouth with a three day head start on the comet. The game takes place entirely within the village and the surrounding area, and your initial goals will be to meet with the locals, try to find a guide to the region, and locate a cross in the woods that Boleskine’s writings point to as the magic spot. The title should clue you in that much more is going on, and it will be up to you to uncover and stop the town’s especially sinister secret (hint: Cthulhu). The dashed line lets you know you can take something. 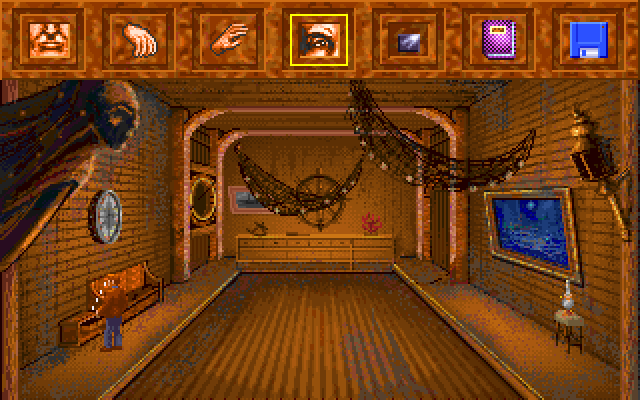 Gameplay is handled as a standard pre-mouse adventure. The arrow keys march Parker around the screen, and a series of hotkeys (or a menu brought up with Tab) are used to trigger the standard interactions (take, talk, examine, etc). Objects you can manipulate are highlighted with a dashed eye line to Parker, much like an old cartoon. While this is appreciated, it’s also unreliable. There’s plenty more within a scene that you can play with (and importantly, search) that the dotted line doesn’t appear for. Mouse support is included in the CD version, but it seems universally reviled. It simply tries to emulate the keyboard instead of providing its own point and click interface. You simply click arrows to move Parker, instead of clicking where you want him to go. What Parker is searching/manipulating is also directly chosen by his proximity – so he’ll search the desk he’s standing next to regardless of if you’re clicking on the map at the other end of the room. The mouse controls do nothing to reduce time or increase accuracy, and in my opinion, can safely be left in the dust. The town and its inhabitants are absolutely central to the story, and some effort has been taken to make them feel like living people. They don’t have schedules per se, but you can spot them sometimes roaming through town on a seemingly randomized basis. Their interactions with each other (always scripted) are key too. If you see two character together, or one leaving another’s house, there is usually some narrative meaning to this. Early on, there’s a robed man hanging around toward the back of the store – he is indeed eavesdropping on your conversation. It’s a neat system, and I found myself becoming a little more cautious and aware of who I talked to or what questions I asked, fearful that there would actually be consequences. 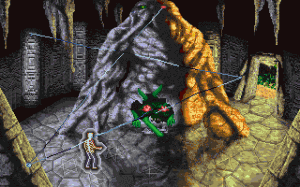 Graphics were, and still are, very striking. They were praised on release, though you paid for them with needing a tremendous amount of high and expanded memory (yay for DosBox!). Artwork is universally lively and colorful, sinister when it’s time for it, and features locations in both day and night variants. Actual photographs appear to have been used as a reference (the trees and skies at dusk show this the most), with colors pared down or simplified by hand. Occasional cuts to cell animation sequences are used to call attention to particular interactions or discoveries. It makes for a lush world that’s still interesting to stroll through today. And on an amusing note, quite a range of known Hollywood actors have their likenesses reproduced here in various roles. I feel confident they didn’t see a penny. By far, the best part of Comet is its phenomenal pacing. The three days form three acts, stakes rise appropriately, and there’s plenty of time given to build relationships and entanglements with the cast of characters (itself not confusingly large). Your view into the mythos unravels much like a slowly-opening door, and both you and Parker seem pretty congruent on the implications of your discoveries. Perhaps it owes to the literary roots, but I didn’t think there was a single misstep in how the story developed. The only points I could argue are the rare fantastical moments – like escaping a lighthouse with a pair of wax wings, or Parker’s complete lack of commentary on morphing into a bird to find an Indian shaman – but the rest is so strong that this feels like nitpicking. There’s a CD “talkie” re-release, if you’re interested. Its technical execution is spotty – some clips cut too early, nearly every line of dialogue stays up in text form for much longer than it took to speak it, and there’s a heavy reliance on short ambient clips that loop far too often. Other than that, it’s an excellent addition. Some acting is cheesy, of course, but most works quite well. Parker’s actor was a particularly great find. 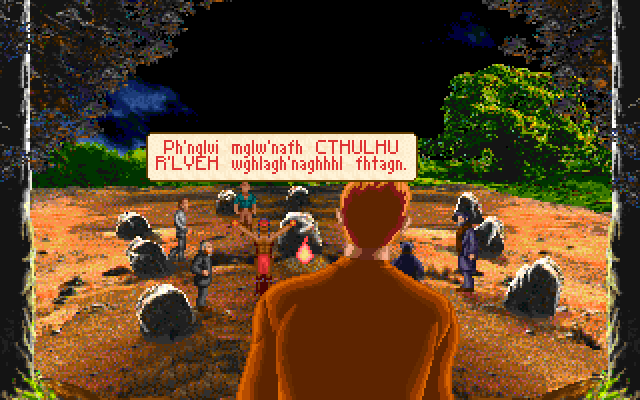 My only real acting complaint is that it seems like Lovecraft’s invented language (used in chants for the Old Ones) wasn’t actually meant to be spoken, or at the very least, the actors didn’t know what to do with all the apostrophes. Although it is pretty hilarious when they just give up and trail off. So we come to the only real black mark against Shadow of the Comet, and that is its puzzles. Most of them strike a fair balance between being challenging and reasonable, but its the stand-out ones that ruin it. The photo developing puzzle is the most notorious. The solution is based on actual development processes and chemistry, but is explained nowhere within the game (and as far as I can tell, not in the feelies either). An issue in the English version mislabels two of the chemicals and further confounds. Then there are chase sequences where the wrong door kills you instantly, some mazes littered with instant death traps, a sliding block puzzle, and some multiple option conversations that will silently ruin the game if you get one wrong. 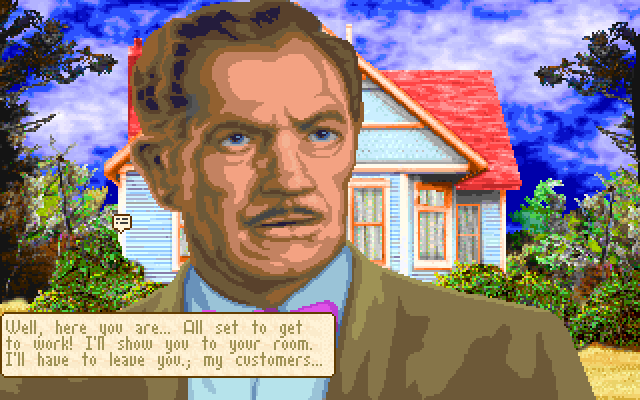 Shadow of the Comet is one of the best of the old-style adventures, and one of the best horror adventures out there. It’s far more “unsettling” and “sinister” than outright shocking, but the horror tag still applies. The only caveat is an equally unforgiving, old-style design. It isn’t afraid to trip you up and sit quietly in the corner snickering whilst you fumble about for the rest of the game. But if you’re prepared, it’s a masterfully-paced ride, and a great mystery – even if you don’t know the first thing about the Great Old Ones. Lovely graphics and art design still hold up. Brilliant pacing. Great example of horror that doesn’t rely on cheap shocks and spilled guts. Generally good voice acting in the CD version. Forget the mouse control, you’re better off without it. A few audio hitches on the CD version. 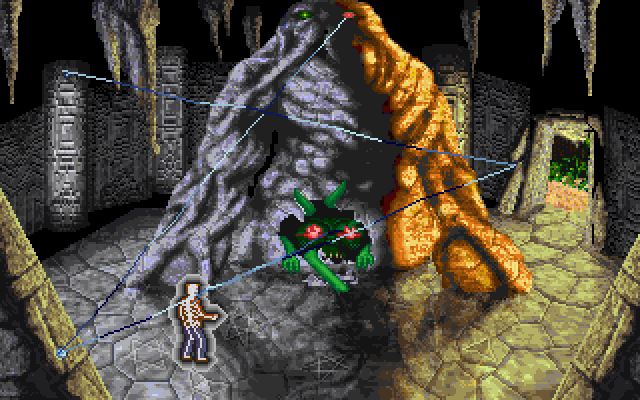 Old adventure design shows little mercy and cares nothing about helping you along – much like Cthulhu himself! I have to agree that this is a very old-school design, but unlike (for example) Larry, it is entirely appropriate. This is bleak horror and it works all the better for the actual threat of death. In differently themed games, on the other hand, it is simply annoying. True, but Jack Nicholson and Willem Dafoe probably could have used the money!